Having just finished watching the documentary (Pre-warning – make sure y'all keep those tissues ready for all those emotional parts! 😢) it has just confirmed to me what I felt from watching the trailers alone. By far, one of the best visual documentaries I have seen for years! Everything was done so tastefully, where you feel captivated and drawn from the very beginning. The video production, editing, sound editing, music choice, narration, facts etc... (the list 'goes on and on and on...') were all spot on and flowed beautifully in a professional manner. I know that this video was not made for any monetary gain, but if I were ever to see a DVD copy of this, I would hands down buy it. I've seen countless documentaries in the past where some facts have not been told correctly, or lack certain parts of Aaliyah's early life, career and the friends who accompanied her. Made by a fan, for the fans, you can tell that a lot of hard work, passion and dedication has been taken in throughly to produce such a heartfelt, emotional film of a woman who touched all boys, girls, men and women. Be it a 'Young Nation' fan or an older generation fan, we can learn a lot about Aaliyah's life just by watching this. I know for one that I definitely learnt some new things I did not know before (I especially loved the music chart receipts from the UK, which if you don't know by now is where I am from 😎). It just generally made me feel so proud to be a fan of hers, and knowing how much love Aaliyah had for her fans, so that was really insightful and refreshing to know. Personally speaking, I'm quite a strong person so I knew I would get teary eyed watching this particular documentary. Never in my life did I imagine the 11 year old child in me to be bawling out my eyes, feeling that same pain I felt that very same day on hearing the news of her passing. It really touched my heart in ways I never thought imaginable. It was like some of my grieving process was still repressed from all those years ago, taking a trip down memory lane, and re-living all those moments I remember watching live on TV as a young kid (both the good and bad). "'AALIYAH - The Inside Look' is a documentary created entirely by Amorphous, as a touching two hour tribute honoring Aaliyah's life and legacy. Through his eyes as a beloved fan, experience getting to fall in love with Aaliyah, once again, as we take a look at her life and everlasting legacy up until 2017. 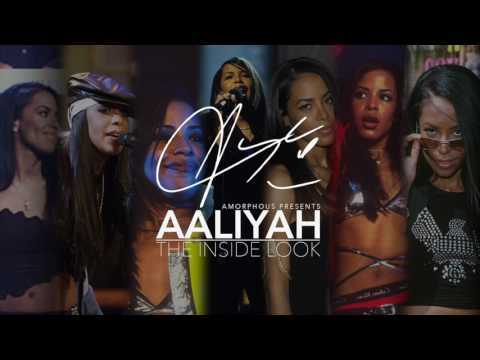 'AALIYAH - The Inside Look' features media from various outlets and channels, including footage from major corporations. I do not own any rights to their footage or music. This documentary is made strictly for entertainment purposes only, and is made from a fan - for the fans. This film is dedicated to Aaliyah Dana Haughton, Michael Haughton, Diane Haughton, and Rashad Haughton."